BD&E works with technology leaders to field test the next generation of ATMs. Do your ATMs offer customer-friendly features? Need to adapt to the future? Consider the new generation of Interactive Tellers. BD&E’s Design-Build Team experts will precisely specify the optimal ATM solution for each of your branches. ATM manufacturers respect our focus on customer behavior so highly, they use us to field test the next generation of ATMs. • Prevent surprises. BD&E will help future-proof your ATMs so that your equipment does not become obsolete. 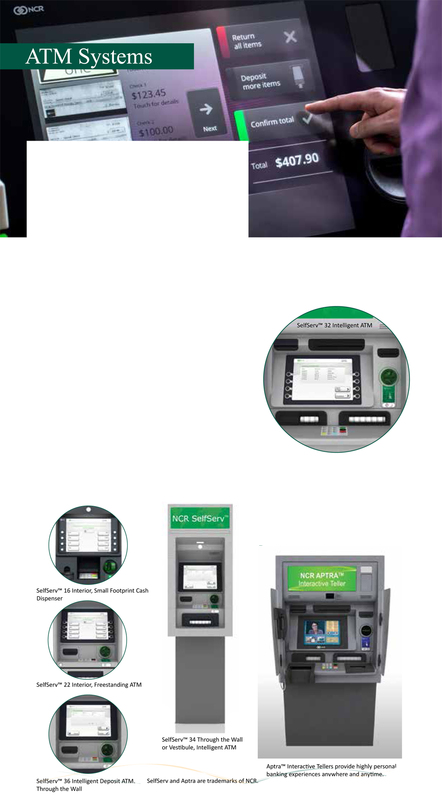 • Experience ATM efficiency with new single-slot, intelligent systems. • Expert ATM configurations keep you in compliance with federal regulations. • Experience simple financing for new and used systems. BD&E experts offer your operations team freedom to choose the best systems for each branch because we know that every branch can be different. Our systems provide your operations team with high productivity solutions that your customers will love. The new interactive tellers offer personal service plus a wide range of services such as bill payments, transfers, mini-statements and more.